“Oh your poor thing” the woman who answered the door said to me “come inside and let me look after you”. I was about to find out if all those stories about bored housewives and door to door salesmen were true . . .
What stirs memory can be very subtle – sometimes a combination of atmospheric condition is needed along with place to really stir the dead leaves of the past. I had totally forgotten about my wildly unsuccessful three-day career as a door-to-door salesman, fresh out of school, more than 30 years ago. Until I drove through Ballybrack in the rain a couple of days ago. 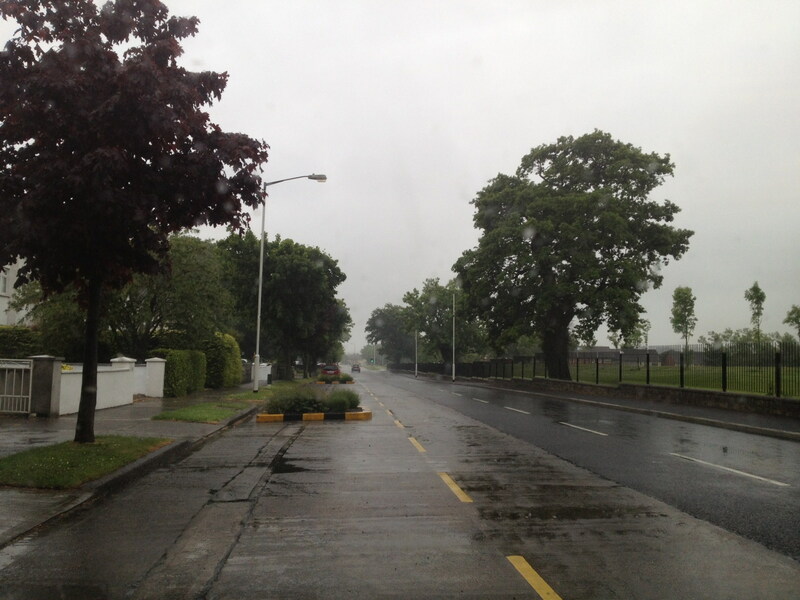 I have driven along Churchview Road a fair few times in recent years, with barely a flicker of memory, but this particular morning the sky was grey and heavy, a soft rain was drizzling down, the trees were dripping . . . and instantly I was transported back 30 years, to the day I trudged this road with a sack of books, and knocked on every door of every road leading off it . . Even at the time, the smart part of my brain knew that any job that I could just walk straight into without experience and with barely a five minute interview, was probably not worth having. But I was determined to stand on my own feet and be independent, and I resolved to give it my all. The publishing company was based in Parnell Square, in the heart of Dublin city centre, and the product was children’s books, and – yes, you guessed it – encyclopedias. I was to be that living cliche, the door to door encyclopedia seller! Judging by the number of people (15) that went through the three-day (unpaid) training course with me, the operation had a huge turnover of sales staff. We trained Monday to Wednesday, and then, on Thursday, were were unleashed on the public for the first time. The whole group of us were taken by bus to Sallynoggin in southeast Dublin, and there met by a supervisor in a van who gave us our stock, and split us up among the myriad of new and old housing estates over the surrounding few square miles. It was a typically wet Dublin day – not a downpour, not blustery, just a steady seeping, weeping soft wetness from a heavy grey sky. I was given Ballybrack – the vast complex of then fairly new housing along all the roads that lead off Churchview Road – Watson Drive, Watson Avenue, Watson Park, Blackenbush, Pinewood, and what felt like a million other places. I started with zest, and swear I must have have knocked on 500 doors that day . . Disheartening of course, both for me, and the poor people whose day I disturbed. Perhaps one sale in every 100 houses. But I was glad to have a job and to be (perhaps) earning money, and I kept at it. I would, of course, be paid commission only, so what I earned would depend wholly on my success rate. As a well brought up (and well read) boy, my sales spiel, if not successful, was at least polite. I was smiling, courteous, and no matter how brusque my dismissal at the door was, I always thanked the householder for listening to me, and apologised for taking up their time uninvited. That last touch actually netted me one of my very few sales – a doctor, who had initially sent me away, called me back as I was walking down the driveway and bought an encyclopedia, explaining that he had never encountered a salesman so well mannered before! That was one of only two sales the first day, and the next day I was back in the same location, to knock on the doors of a further 400 or so houses. Late in the morning, I hit the jackpot. Knocking on yet another door, which was opened by a rather harassed looking young woman, I listened in disbelief as she told me that herself and a friend, to whom she quickly introduced me, were in the process of setting up a creche, and had just been discussing the fact that they needed childrens books! I can’t remember how much I sold them, but it probably accounted for more than half of all my sales for the whole week. When I say “creche” this was of course, the pre-modern-regulation early 80s version – i.e. 7 or 8 toddlers being looked after by the pair in a normal 3-bedroom terraced house, hence their rather fatigued demenour. Later in the afternoon, footsore and weary, and still with far too many unsold books in my heavy bag, I knocked on yet another door, and encountered that fable of lurid fiction, the housewife who didn’t want to buy anything, but who liked the look of me, and invited me in. Luckily for me, as I was far too innocent in those days to know how to handle such a situation, this was Ireland in the 1980s, and not America or (as I would discover a few years later) the much more liberated England. The Irish Mammy who said I was a lovely looking young thing and invited me into her house did so in order that . . she could give me a cup of tea, and suggest that we say a few prayers together to the Virgin Mary that I might get a better and more rewarding job ! And even if I was disappointed that nothing else was on offer (like the purchase of a book – what else would I be thinking?) the tea was very welcome, and I was touched by her concern for my welfare, and her determination to offer up prayers for my future. The following day, although a Saturday, was to be a work day, as the publishing house insisted on a sic day week. This time I was taken to Finglas, for an utterly soul destroying day in which I knocked on seemingly a million doors, was chased away from many of them, and did not sell a single book in 9 hours of pounding the streets. Somehow, my southside accent and polite sales spiel did not seem to be quite so appreciated here. At the end of the week, I had managed to earn myself the princley sum of £13, but out of this I had paid for my bus fares and meals, which reduced my earnings to around £5, or, I calculated, around 3p for each door I knocked on. I knew then that it was not for me, but was pleased with myself that I had lasted longer than most of the class – of the 15 trainees, only 12 had gone out selling on the first day, only 5 remained on day 2, and there were just 2 of us to cover Finglas on the Saturday. And, presumably, a new class of 15 fresh-faced school-leavers to start training on the Monday morning . .
Now, many decades later, and with a solid career in IT management over the years, not to mention a quarter century of radio work, and an emotionally rewarding writing sideline, that first week of commerce after leaving school is long forgotten in my past. But memory is a funny thing, and the weeping sky and rain sodden trees along Churchview Road brought it back to me, clear as a bell, as I happened to drive through the area last Thursday morning. So long ago that it seems to me it might have happened to another person. Many of the people whose doors I knocked on will be gone now. I wonder how the two ladies setting up the creche fared – was their career as short-lived as mine, or do they now run one of those big modern purpose built childcare centres around the city? And I have to smile when I think of the woman who gave me tea and prayed for me to have a better career. So nice of her to care for a stranger. Somehow, I’d love her to know that her prayers were answered. Hi Steve..came across this post. I suspect I worked for the same publishing house in the late 80s in Parnell Sq. Although I suspect they were resellers of somewhat dubious report rather than the real thing. I recall the trainer’s name and all. I grew up near where you were deployed but I got Wexford, lasted 4 weeks and put it all down to experience.